Plus tax. Coupon must be presented at time of write up. Cannot be combined with any other offers or coupons. Valid only at Mercedes-Benz of St. Paul. Coupon must be presented at time of write up. Cannot be combined with any other offers or coupons. Valid only at Mercedes-Benz of St. Paul. Plus tax. Coupon must be presented when order is written. Cannot be combined with any other offers or coupons. Valid only at Mercedes-Benz of St. Paul. Our exceptional Mercedes-Benz Service Department is serving Maplewood, Minneapolis, St Paul, Duluth, Woodbury and surrounding areas. Our Expert Service & Parts staff assists our customers in keeping their Mercedes-Benz vehicles in great shape and works with you for the best experience possible. We carry the complete selection of parts and accessories available in Minnesota. 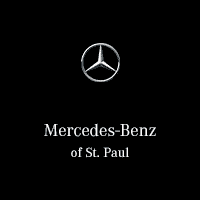 At Mercedes-Benz of St. Paul, we are your one-stop shop for all your Mercedes-Benz service needs and customer service is our number one priority. If you plan to service your car, you will always find the most competitive prices and tremendous service at Mercedes-Benz of St. Paul. Our state of the art service department will keep your new or pre-owned vehicle in excellent condition and our friendly staff will make your every visit a pleasant one. Our certified service technicians will keep your vehicle running like the day you bought it. So bring your vehicle in for your next service appointment and treat yourself and your vehicle the way you both deserve. The staff at Mercedes-Benz of St. Paul looks forward to serving your Mercedes-Benz needs and we look forward to the opportunity to tailor your next service.